Air Rifle Hunting through the Seasons - Mat Manning's new book. 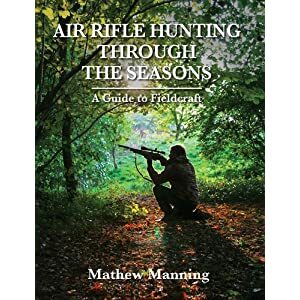 Airgun Shooter scribe and Planet Airgun member Mat Manning will have a new book out soon, called 'Air Rifle Hunting through the Seasons - A Guide to Fieldcraft'. Mat explained to me recently that the new book will emphasise moreso on the different techniques used to bag quarry in the changing seasons throughout the year. There's also going to be more recipes in the book, to enable you to enjoy the fruits of your hunting trips to the fullest.......I rather sheepishly (pun intended) admitted to Mat that I have already pilfered quite a few of the recipes from his first book 'Air Rifle Hunting - A complete guide' for the Planet Airgun Cookbook. Thankfully, he informed me that recipes are one of the few things that are not covered by copyright, and that I was welcome to do so anyway.....Phew, Thanks Mat! So what with Mat's new book out soon, and another tome just released by fellow Airgun Shooter scribe Ian Barnett, we won't be lost for something to read on the cold, dark winter nights that are heading our way. New Mat Manning Book Out Now. Published by McNidder and Grace, Mathew's new guide to hunting and shooting skills is said to be "a must have for anyone who wants to get the most from their airgun shooting and stay one step ahead of their quarry." The release blurb says, and I quote.. Whether controlling pests on the farm or hunting meat for the pot, the airgun shooter has to pit his wits against the finely tuned senses of wild creatures that run the gauntlet of survival on a daily basis. Through this 150 page hardback book, which features more than 100 colour photographs, Mathew shares his wealth of experience to help you tip the odds in your favour. Air Rifle Hunting Through the Seasons covers in detail the skills of fieldcraft: the hunter's deadliest weapon. Join Mathew for a year in the countryside and learn how to read the signs provided by nature and then make the right decisions to enjoy consistent success in the field. Mathew draws on 25 years experience as an airgun shooter to describe more than thirty of the hunting scenarios to be encountered through the year, from decoying crows and magpies and hide shooting for pigeons to long range rabbiting and squirrel control. He offers easy-to-follow guidance on how to pre-empt the habits of quarry species along with various techniques and tactics he uses to exploit hunting opportunities throughout the year. You'll also be able to turn a fruitful day's shooting into a delicious meal with Mathew's helpful notes on game preparation and a selection of his favourite recipes, including Pigeon Pasties, and Rabbit with Apple and Cider. Author of the acclaimed 'Hunting with Air Rifles - The Complete Guide' (2010), 'Air rifle Hunting Through The Seasons' builds on the basic overview of the first book to enable hunters to hone their fieldcraft skills and advance their understanding of quarry behaviour. I've only had time to read a few pages, but so far it looks highly informative and entertaining, but after I've had opportunity over the Christmas holiday to give it a good read, I'll post up a proper review. Re: New Mat Manning Book Out Now. Thanks to the arrival of snow to my area today, I've had the opportunity to stay indoors and finish the last few chapters of Mat Manning's new book, and now as promised, feel qualified to write an appraisal of it. This hardback book differs from almost every other airgun hunting tome I have read, in that it approaches the subject not by offering tips and advice of tackling each of the individual quarry species in their own specific chapters, but by instead focusing on what shooting opportunities each of this Country's four seasons can provide to the airgun hunter. I find this format quite refreshing, as the advice for hunting rabbits or woodpigeons for example, is re-visted for each season, rather than a whole years worth of advice being crammed into just one chapter on that particular quarry. This makes for a more diverse and interesting read IMHO, because if you rarely get to hunt a certain species, it no longer means a whole chunk of the book is personally irrelevant to you. As for the content of the book, I found it highly entertaining and absorbing, and whether you are new to airgun hunting, or you're a seasoned and successful hunter already, the book offers rock solid help and advice that you either may not already know, or go to remind you of techniques that you may have simply forgotten about, but that are the basis and staple of being an accomplished airgun hunter nonetheless. Both of those situations were applicable with regard to my own knowledge and experience, so I definitely gained positives from reading this book. There are plenty of colour photo's thought, which add to the enjoyment by giving a visual window into the hunting scenarios Mat gets into throughout the year, rather than being left to imagine them for yourself. At the end of each of the four chapters dedicated to Spring, Summer, Autumn, and Winter, are a selection of delicious sounding recipes appropriate for the fruits of your hunting trips of that season. Rest assured that in due time, a few of those recipes will somehow find their way into the Planet Airgun Cookbook section!! Mat then provides advice on current airgun law, insurance, kill zones, and that old airgun chestnut, calibre! Finally, the book closes with an excellent few pages about preparing your shot meat for the table. So, did I enjoy this book.......Yes. So, would I recommend this book for the quality of it's given advice?.....Yes. Lastly, would I recommend this book as simply being a very entertaining, and different, airgun associated read?.....Yes. If your looking for a book to help sharpen your hunting skills, and hopefully get bigger bags, then you would do very well not to overlook this excellent book. Re: Air Rifle Hunting through the Seasons - Mat Manning's new book. I wondered if anyone would notice that!! If you'd like to have it signed Dave, I can ask Mat to do that when I next see him, if you want to send it down to me?